Once I got my chicken brooder box all set up, the first thing I did was test the lighting. 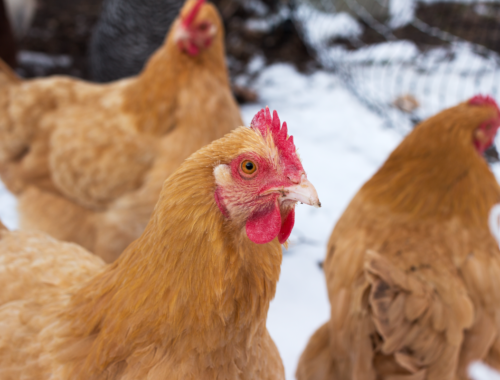 One week old baby chicks need to have their heat lamps set at about 95ºF, then have the temperature decreased by about 5* per week after that as they grow. I set up my heat lamp with the 250-watt red heat bulb from Tractor Supply, and I put it directly onto the chicken wire top on the brooder box to start … the thermometer I placed on the floor of the brooder under it read 120ºF! Next I tried a 100-watt white floodlight bulb. That registered around 100ºF. Finally, I tried a regular white incandescent 60-watt bulb. It was still almost 100ºF. 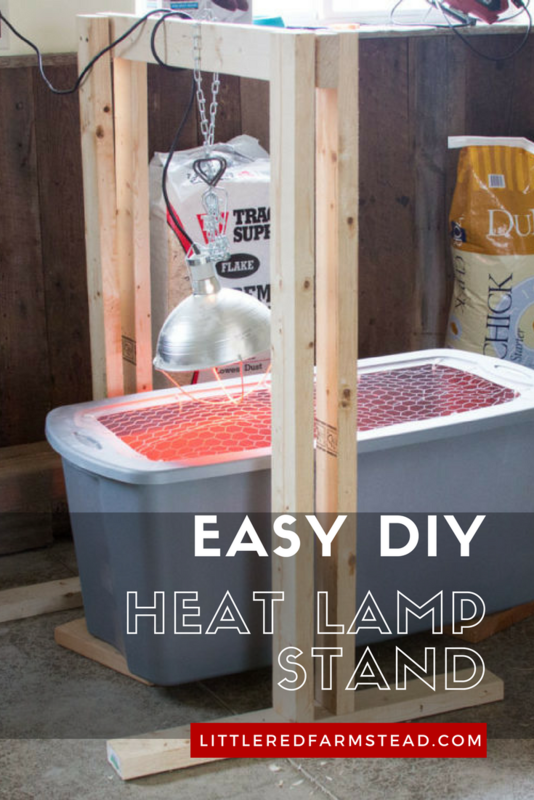 I quickly realized I needed a different solution to secure my heat lamp so that I would be able to back the lamp up high enough to cool the brooder off a bit! I’m no builder and only have some basic tools, so it had to be a simple solution. The brooder is indoors with our kids and pets, so it also needed to be safe and secure to prevent fires and so that no one would be hurt. I sketched up the simple solution below that uses only three 2×4 boards and a few wood screws. It took me about 30 minutes to assemble m and I’m pretty proud of the results! Like I mentioned, I kept it very simple because I mostly have basic tools around the house. I’m sure you could use a hammer and nails in place of the screws if you like, but I felt the screws would be more secure so I went with those. I designed this stand so that it wouldn’t need any specially-angled cuts. This way, you can walk into Lowes or Home Depot, purchase your boards, and have the cuts made right there if you don’t have any saws at home. Two 2″x4″ boards will be cut in half, yielding four 4′ long 2″x4″ boards. The remaining 2″x4″ board will be cut into 3 pieces: one 3′ long, two 2′ 6″ long. I wasn’t really precise or neat with my assembly; I was going for function over form. I’m sure it could be done more neatly, but I just wanted to make it secure and get the job done. Start by pre-drilling the holes at the top of your four 4′ uprights where they will be screwed into the 3′ cross-piece. I didn’t do any measuring here and just “eyeballed” the spacing of the holes. For the uprights, you should drill clear through the board. After pre-drilling the holes in the 4′ uprights, I held a piece of scrap paper to the board and marked with a pencil on the paper where the screw holes were. Then I used this paper to mark on my 3′ cross-piece where the screw holes should be made to attach each upright. I then pre-drilled these holes — they do not need to go clear through the board, instead only about a 1/2″ deep. Now you will pre-drill 2 holes in the bottoms of each of the 4 uprights. Again, use a piece of scrap paper to mark the drill-pattern you create. Use the paper to transfer the drill pattern into the approximate center of each of the two 2’6″ boards that will be the “feet” of your stand. Pre-drill these holes clear through the foot boards. Using your 3″ wood screws, attach each foot to the bottom of the 4′ upright boards, drilling through the foot from the bottom and up into the upright. Optional: I felt the stand was sturdy enough for us as-is, but if you have the extra materials and tools needed, I highly recommend adding some extra supports to the base. These are indicated by dotted lines in the drawings above. That’s it! I think it took more time for me to clean up my dining room from all the sawdust from pre-drilling than it did to assemble the entire thing. I did it on my own, but a second set of hands to hold things while you drill would likely make the work even easier and faster. 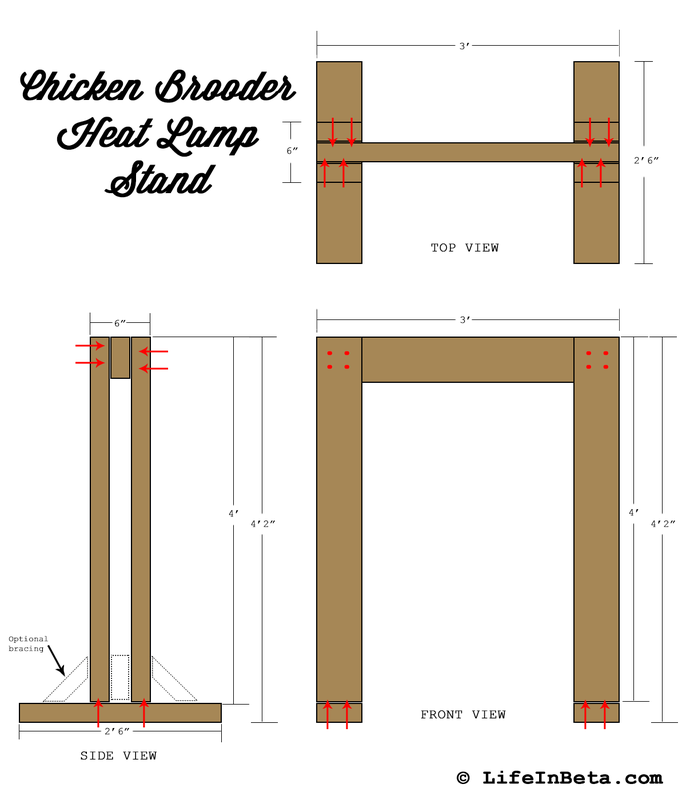 If you happen to use these plans to build a heat lamp stand of your own, I’d love to hear from you! Please post in the comments or contact me to share your experience and photos. I am not a builder, and I wrote these directions from the perspective of a novice who just happens to love power tools. I think there’s a lot of others out there like myself who need simple directions go build projects like this though, so please excuse my basic explanations which are probably laughable to all the experienced builders who might happen across this post! 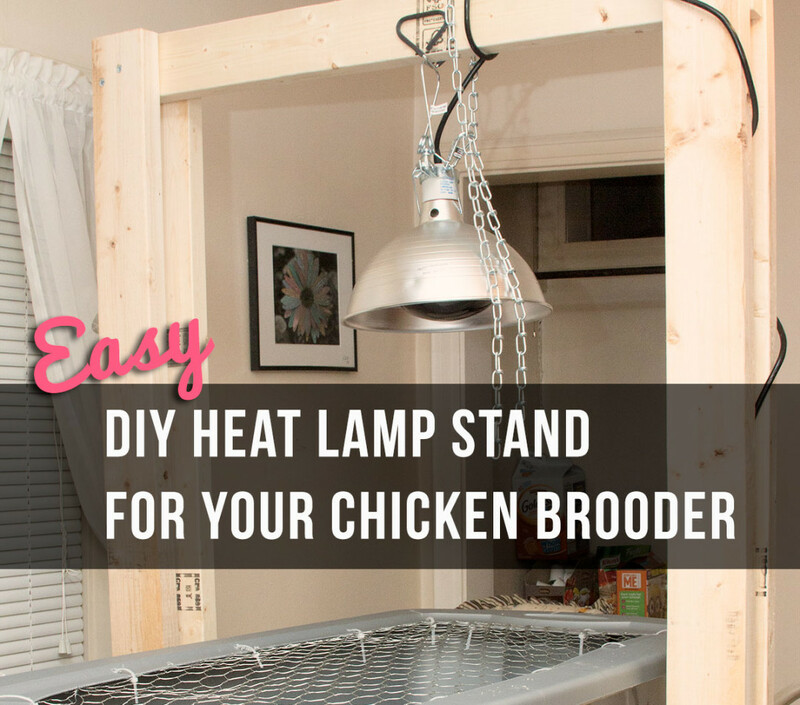 Brooder heat lamps are extremely hot and dangerous and can cause fires. Please use your best judgment when using these plans to build your lighting stand. I assume no responsibility for any accidents that may occur. Safety first, friends! 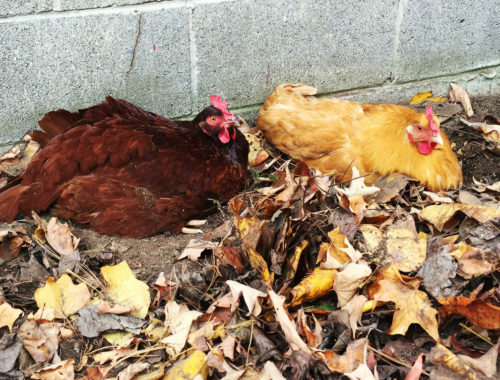 This post was part of Homestead Blog Hop #22 – hop on over to see other great posts!